A Hillside View on the Ranch in Livermore, CA. My hunt started on the second day of the 2014 California A-zone deer season. It was during the mid-afternoon, Livermore, California heat, when I spotted a really tall forken horn buck feeding above a spring. The buck was about 1000 yards away, so the stalk was on! I took my time sneaking into shooting distance on this blacktail buck, stopping every once in a while to make sure he didn’t spot me sneaking up on him. At about 354 yards, I realized that was the closest I was going to get to the buck, while still having a clear shot. I was on top of a finger, across from the spring, where he was feeding above. 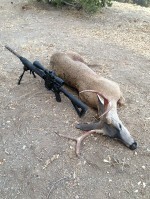 I pulled out my Leupold RX-1000i TBR and ranged the buck. He was 354 yards away and feeding perfectly broadside. He had no idea I was there, so I took my time. Laying down, I leveled out my AR with my US optic level and locked it in using my Harris bipod. With my Nikon P223 scope I put the 350 yard hold-over crosshair on the bottom of the buck’s chest, just behind his shoulder and squeezed the trigger. At the shot, I heard the bullet connect on the buck, as he stumbled down the hill collapsing 30 yards from where he was shot. California Blacktail Deer Taken with an AR15 in 5.56. I stayed in my spot, with the crosshairs on the buck, waiting, to make sure he was down. After a minute of waiting, I hiked over to the downed buck. When I got to him, I could clearly see the entrance of my bullet, a perfectly placed heart shot. I rolled him over and there was a baseball sized exit wound. I couldn’t have been more excited! After about ten minutes of just sitting there in awe and thanks, I began the hard part of packing the buck out. On this hunt, I was using my first AR15 build. It is a Franklin Armory lower with a Stag Arms upper (Model 6HL) in 5.56. I have a 3.5 CMC single stage trigger with a US optic level. The scope that I have on my rifle is a Nikon P223 4-12×40 BDC 600. My bullet of choice is the Barnes VOR-TX 55gr TSX, Lead Free BTHP. 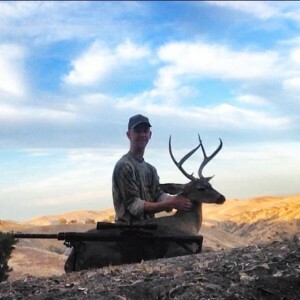 The Author with his California Blacktail Deer after a Successful Hunt. I'm 22 years old and have grown up hunting since I could hold a gun. 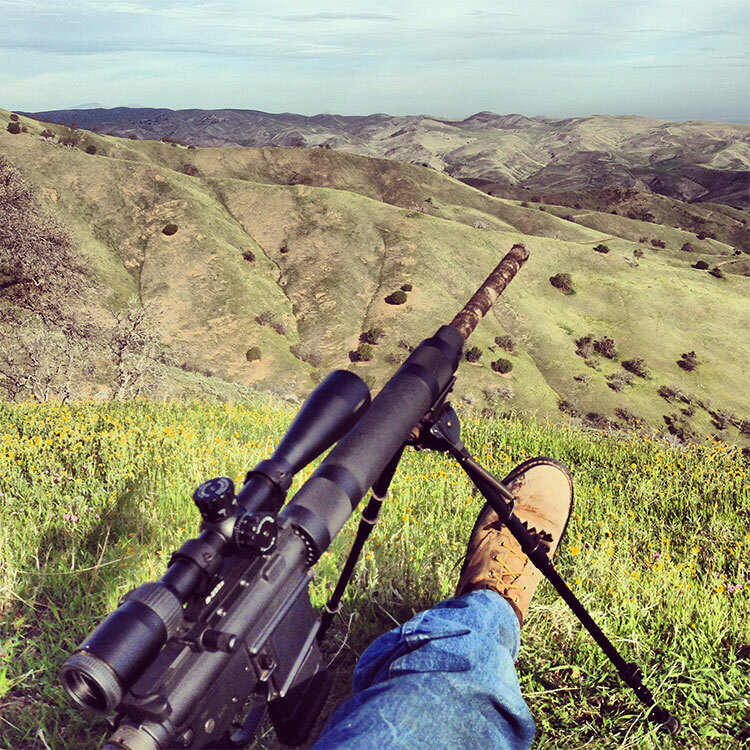 I am the owner of California Hunting Addiction on Facebook.I created it to help bring the California hunting community together, share stories, and make new friends.